plastic handle, we also provide this kind pail with metal handles. These products are durable. Our products have past ISO-9001 quality certification. All our products are tested strictly. Drop them full of water from 1.2m high,there is no crack no leak.We can print various patterns on the pail and lid respectively according to customer's demand. 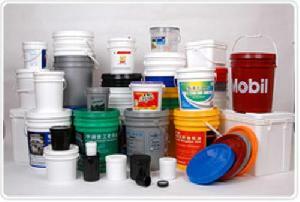 We can also give the pail full print, 6 maximum different colors can be printed on the pail. These products are mainly used for packing oil,lubricants,oil,coatings, paint, chemicals,flowers,adhesives and so on.